Dual Side Service Access Doors with quarter turn latches provide access to all filters, motor, and coils. Comfort is so much more than temperature. 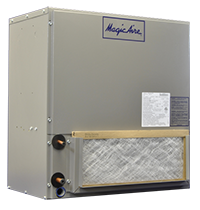 Magic Aire’s NDB is a low sound, energy efficient air handling unit providing multiple options for comfort conditioning and fan control. The NDB is a perfect fit for classrooms, assisted living, condominiums and all quality living spaces. Precise Load Matching: Need to create a single zone VAV system? With electronically commutated motor technology you can match your load and save more energy! With your choice of either five discreet speeds or true variable speed fan control it is easier than ever to achieve your comfort goals. Allows optimization of system for humidity control and occupant comfort while minimizing sound levels. 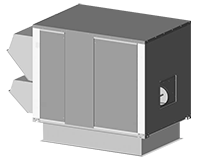 The modular air handler series can be utilized with various blower discharge configurations of vertical, horizontal and even counterflow. Available from 2 to 20 tons, available options include chilled water and DX cooling coils, heating coils, mixing boxes and leg kits. Sizes 2 to 3 ton are only available in top and bottom discharge. Isolating motor sled to reduce vibration transmission in downflow models. Double Wall Units have sturdy hinged service doors provide convenient and dependable service access. Textured steel with durable powdered coat finish stands up to years of severe weather. 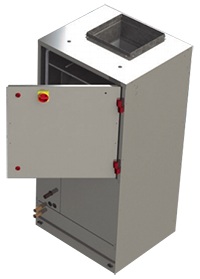 Vertical duct coils in DX and hydronic configurations are available in 2 Ton through 10 Ton sizes, with and without cabinet, and in 15 Ton size (R-22 or R-410A) with cabinet. Popular sizes are in stock for immediate shipment. Contact your sales representative for available configurations. 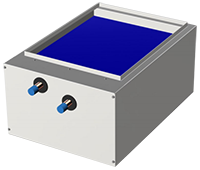 Hot Water Booster Coils are available in a range of sizes from 14.5in x 17.0in up to 27in x 32in, and with face areas 1.30 sf to 5.2 sf. 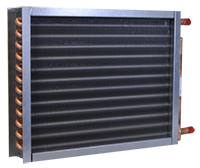 Cased hot water coil for air handlers in horizontal or vertical upflow discharge. Casing is embossed galvanized with foil face insulation. Vertical direct drive air handlers are especially adaptable for installation in an apartment closet type area. Unit design allows for connection to remote condensing units, chillers and water heating systems. These units are available in 1 to 2.5 ton sizes. Field-installed electric heat or 2-row hot water module. These floor exposed vertical fan coil units are available in 200-1200 CFM vertical configuration. Models FFC and FSC are floor mounted vertical units with exposed cabinetry. 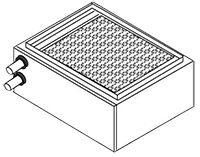 FSW units have a sloped top design angled at approximately 20 degrees. Horizontal direct drive chilled water/DX air units, 400 to 1000 cfm (1Ton to 2.5Ton), with numerous factory options and field installed accessories. 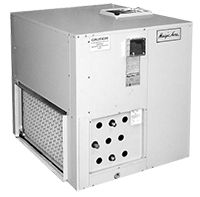 MagicAire® Unit Ventilators are designed for a variety of applications where indoor air quality is critical, such as classrooms, hospitals, etc. They provide an energy-efficient means for maintaining excellent room conditions. A wide range of options are available to meet any specification, both in horizontal, UHF, and vertical, UVF, configuration. 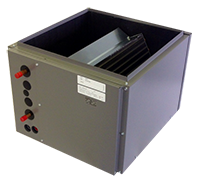 Horizontal units mount exposed or recessed and range in size from 750 to 2000 cfm. 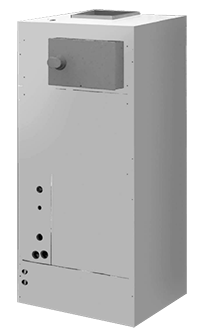 Vertical series units range in size from 500 through 1500 cfm. Units are available with chilled and hot water (2 or 4 pipe systems), remote sourced DX, and steam or electric resistance heat. 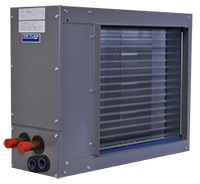 Magic Aire® Self Contained Unit Ventilators are designed for a variety of applications where Indoor Air Quality is critical, such as classrooms. These integral sourced DX units provide an Energy Efficient means for maintaining excellent room conditions. 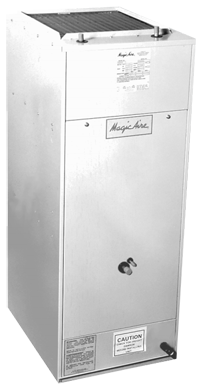 With Magic Aire’s variable speed system the unit has a broader capacity range than traditional self-contained unit ventilators. Also, traditional systems address part load conditions with unloading techniques but these solutions are inefficient, either because high compressor efficiency cannot be maintained at part load or because load matching ability is limited. In contrast, the variable speed compressors are designed to maintain high efficiency at part load by precisely and continuously matching the load and have a significant low start and stop noise level due to the speed ramp function. And, with Flexible DDC Control Packages the units can be integrated into a Building Management System network or ordered for Stand-Alone operation for Precise Control.